* A new design joins Mariell's top selling trademark Cubic Zirconia bridal collection which offers Hollywood glamor. * This set is bold in sparkle, has graduated teardrops and has a bit longer length than most. * This guaranteed best seller is a must have for every wholesale jewelry display! 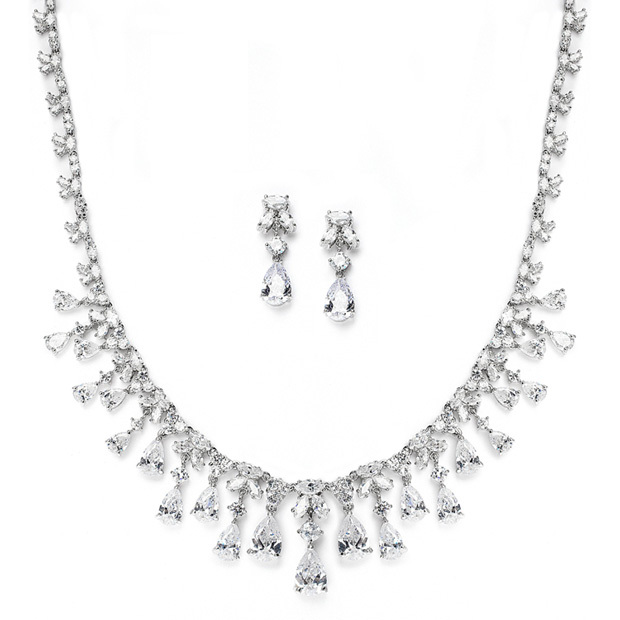 * Joining our top selling trademark Cubic Zirconia bridal necklace sets is this silver rhodium set with graduated dangling CZ teardrops. * The opulent 18" necklace is 1 1/2" h at the center & has 1 1/2" teardorp earrings. * Wear this and expect all eyes on you!